Washing the jeans. Preferably, choose a pair of jeans that are a bit worn out. In case you have chosen a brand new pair of jeans, run it in the laundry for about three to four times. Choosing the spot for the rip. When you rip your jeans, the rip should be located on a pressure point like knees, hips or a pocket. These areas are those that often rub against surfaces in your daily chores. Ripping jeans is not a simple thing and involves strategic planning. Cutting a small slit. Using a scissors, make a tiny slit at the centre of the area that you have chosen to rip. Rubbing the spot. This is done using sandpaper or a file. Get the roughest sandpaper or file you come across. Rub the spot that you have chosen to rib forcefully. Shaping the rip. Shape the rip by making use of a safety pin. In case you prefer a hole rather than a slit, you will probably need assistance. Make use of the pin to pull threads from the slit. Begin ripping the jeans with the first thread. Insert the pin between two threads and gently loosen a thread. Once the thread is loosened, rip it off from the jeans. Continue to rip threads one at a time till you achieve the desired slit. Rubbing the fabric once more. Once again, use sandpaper or a file to rub the slit created to roughen it. You may leave a few frayed threads in place if you desire that look. Washing the jeans. After achieving the preferred rip, toss your jeans into the laundry once again. Rinse them in the laundry at least twice. You may mix a spoon of bleach with the water to fade your jeans and the rip’s frayed edges. Wearing the jeans. Flaunt your jeans by wearing it. 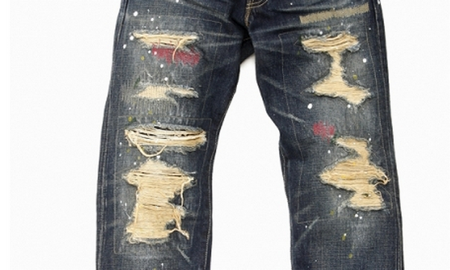 The more frequently you wear your jeans, the more your rip will become used up. It will soon start giving the feeling that you have owned and worn your jeans for a very long time. Be proud to flaunt your creation. Ripping your jeans is a skill that will require some practice. Begin with small sized rips and once you attain enough practice, you will be able to design your rips like a professional.